This course aims to offer an insight into diagnosis and assessment of individuals with Autism and examine strategies to enable and support them with everyday living. This course aims to offer an insight into working within child and adolescent mental health services, including the various social, biological, physiological and behavioural factors. This course covers standard infection control practice; the chain of infection and an introduction to infection control principles and practice. As well as a large course directory, we also offer specifically tailored programmes that are designed to meet each individual client’s needs. 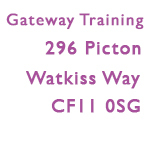 Gateway are dedicated to delivering first class training alongside a range of consultancy services. Drawing upon our vast experience, as well as an enviable industry background, we provide solutions that are both vital and highly cost–effective. Coming from a non-clinical background, I found the course very informative and it has helped me better understand the environment in which I work. I am able to apply the theory I learnt in my day-to-day work. The training needs analysis undertaken gave a better insight into our needs for future staff development. They understood our needs perfectly. The course was very lively and interactive. We received plenty of positive feedback from students and we would not hesitate to use or recommend you again in the future. Having used other training companies before, we were delighted with the training we received. The course was easy to understand, fun to participate in and the subject was tailored perfectly to our needs. Thank you.